Welcome to the Land of Smiles, as Thailand is affectionately called. When we were in Penang (Malyasia), we got a bit antsy to cross over the border into Thailand and arranged to take a minibus for the 9+ hour trip to Krabi, in Thailand. Three minibuses, a ferry and 12 hours later, we arrived at our destination, Railay Beach. 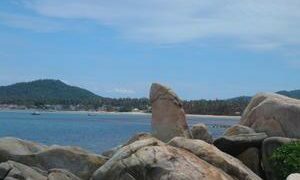 When we first started planning this trip, Thailand was one of the countries that was a must see and in particular, we had dreamed about the Thai beaches. We’d seen pics from friends who had been in the islands and knew we wanted to spend quite a bit of time in the islands. We’ve spent this first week on the Andaman Coast (the west coast) and it is full of the most spectacular scenery ever. and that these traditional boats are still the main transportation method. It is low season on the Andaman coast and so its been fairly quiet on the islands. The scenery is truly spectacular and hopefully the pictures do it justice. Towering limestone cliffs rise up out of the water with islands scattered randomly throughout the waters. 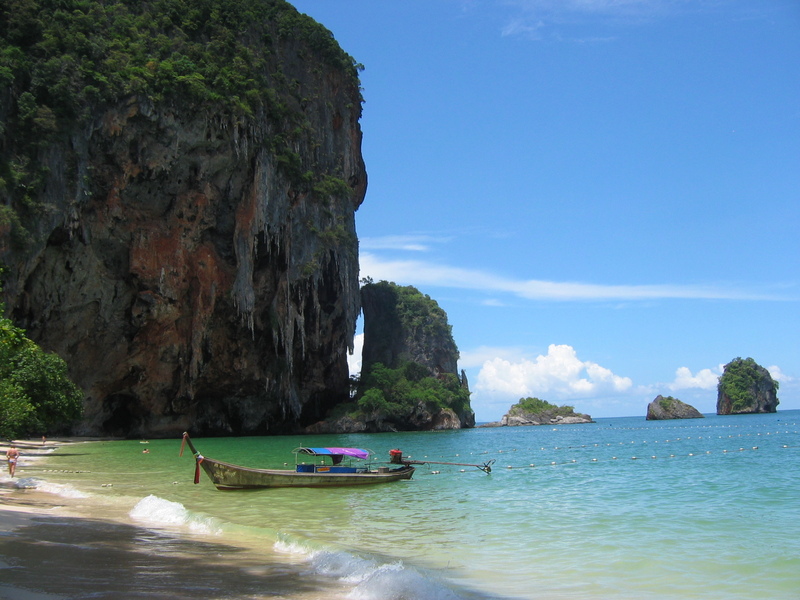 The water in Railay is an exotic emerald green, with patches of turqoise surrounding the white sand beaches. This is the Thailand we imagined when we dreamed of our trip! Railay is a bit of a quiter place and for that reason we knew we would like it. 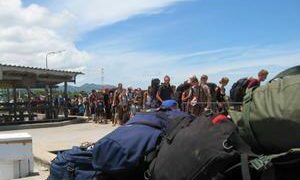 At the islands we visited, backpackers mix with package tourists, mainly from Europe and the UK. Accomodation has been basic bungalows on the beach, costing $10-15 Cdn. 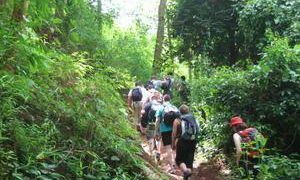 and even Malaysia, we had trouble getting used to the mainstream backpacker culture. Well, so do we and the setup in the beaches makes you feel like you are in a tropical version of your home country. Don’t get us wrong, in the week we have been in Thailand, we have loved it. But we just hadn’t realized how developed the backpacking scene was here. You get sick of walking past bars hearing one of Jack Johnson, Bob Marley or Tracy Chapman! You really have to make an effort to get out there and eat at non-farang (farang = tourist) places and try to get off the beaten path, which is quote difficult when there are thousands of backpackers in Thailand. This one topped out at 100 ft.
in Railey Beach. The guide (Tex Rock Climbing) basically asked me if I’d climbed before and could belay, then he tied in a jumped right on the wall totally trusting me. My favourite route was a 100 ft ending in a cave halfway up the cliff, that I could crawl into and sit with an amazing view of the bay. Unfortunately I didn’t have a camera on me, so you’ll just have to climb up there yourself to experience the beautiful view. Railay is one of those places, you could plan to spend a few days and stay a few weeks. But for us it was off to Ko Phi Phi. Ko Phi Phi consists of two islands, Phi Phi Don and Phi Phi Leh that are very well know for two reasons. First, the Hollywood blockbuster, “The Beach” was filmed here and second, in the 2004 tsunami, Phi Phi was one of the islands hit the hardest. of the people here and a lot of rebuilding has already happened. You can still see evidence of the tsunami’s destruction. We found a great little place called Viking Bay (beside Long Bay) with a basic thatch bungalow overlooking the beach. We dragged our butts up to the Phi Phi viewpoint for the beautiful view of the two lagoons, even though it was a very cloudy day. The next day, we went out for a packaged tour snorkelling around the islands. It was a beautiful day and we first went around Phi Phi Leh and saw the famous Maya Beach, where the movie was filmed. The bay and beach are gorgeous, although they don’t look quite as good as in the movie, which was digitally enhanced. The snorkelling was really good and we saw lots of colourful fish and coral, including my fav, Nemos (Clownfish). The water is beautiful to swim in and is as warm as bath water. On the tour, we also went around Phi Phi Don for lots of snorkelling and swimming opportunities. Cruising around on the boat all day was great and so sometimes packaged tours can be the way to go. After leaving Phi Phi, we headed to Phuket, which is an international beach destination. The scenery here is not nearly as spectacular, but offers your standardized beach holiday destination. Phuket was also hit hard by the tsunami, which is most evident by the lack of trees along the beach. However, it seems that the aid for the tsunami has been used wisely in that most things have been rebuilt and there are many precautions now put in place to prevent a disaster of the same magnitude. There are tsunami evacuation routes planned with signs directing people to higher ground and a loudspeaker system installed that can communicate warning along the beaches. so great to talk to people from home. Travelling really makes you appreciate what you have at home, most of all, friends and family. Of course, we love the Thai food, which really is world class. The Thai language uses its own alphabet, which means that we cannot even recognize words. In Malaysia, we often ate in places that didn’t have English menus and it was fine because we could recognize Malay words, which uses the same alphabet. However, since the alphabet is different here, it is hard to eat in places that don’t have an English menu. Of course the places that do have English menu, make toned down Thai food for the farang palate. Thai food is world renowed and for good reason. We often eat in little stall restaurants, where they have about 100 things on the menu and it is amazing that you can order anything and in less than 15 minutes, they will whip up the most delicious concoction. Like all backpackers, we love the pad thai, which is always good and always the cheapest thing on the menu! shake stands, which are everywhere. They serve up super cheap pancakes, which are really like rotis, with varieties like banana, cheese, chocolate. The fruit shakes are another fav! We’re cutting across the thin strip of the Thai peninsula tomorrow to head to the east coast islands. First stop is Ko Samui. We’ll leave you with this quote.